I can’t help it. My thoughts are already turning to summer. Our eldest is graduating from homeschool and we are celebrating and looking forward to summer fun! This year we are going to enjoy some summer learning with coloring books. As you know, homeschoolers are always learning. And, like me, I am sure that you are always on the look out for simple, frugal and fun tools for just that – learning. Throughout the year, but especially during the summer months, I like to emphasize summer learning with coloring books. We also love to supplement our regular studies with these quality coloring books. They are simply fun. ~Don’t miss the discount code plus the giveaway at the end!! 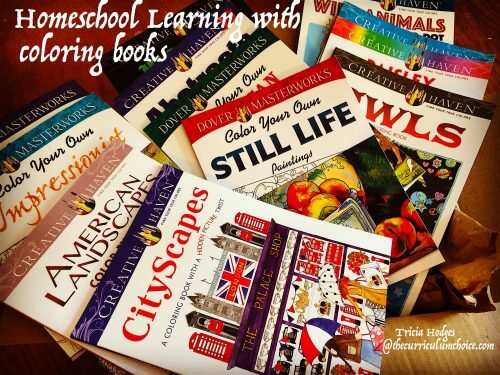 We received this stack of summer learning with coloring books from Dover Publications in exchange for an honest review. All opinions are our own and we are so excited about the summer stretching ahead and a stack of coloring books for all! Please see our disclosure policy. Dover Publications has some excellent resources for homeschool learning with coloring books. High quality, sturdy books that are easy to take with us. Take a look at this box of awesomeness from @doverpubs 📚 Yes I am already thinking of long summer afternoons, road trips, around the town errand days. Plus ART afternoons. 🎨 Oh the FUN and the learning for all our ages! You likely have colored pencils, sharp-tipped markers and/or crayons at home that you can use. We decided to splurge and swing by the local arts and crafts store for a new pack of sharp-tipped markers. Because by the end of the school year ours are looking a little ragged and dried up. Guess what we saw in the ‘Trending Now: Coloring Books’ section? 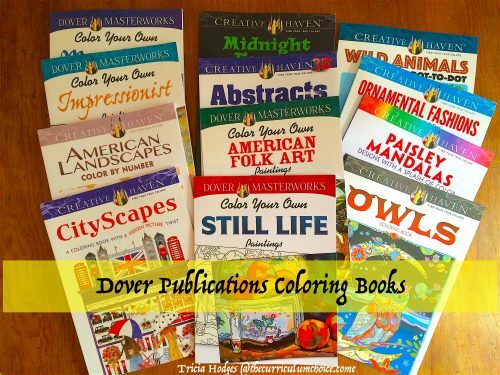 Many of the Dover Publications coloring books in our wonderful stack! But, you can order directly from Dover Publications, using the 25% discount code, and save money on the already frugal books – without even leaving home. 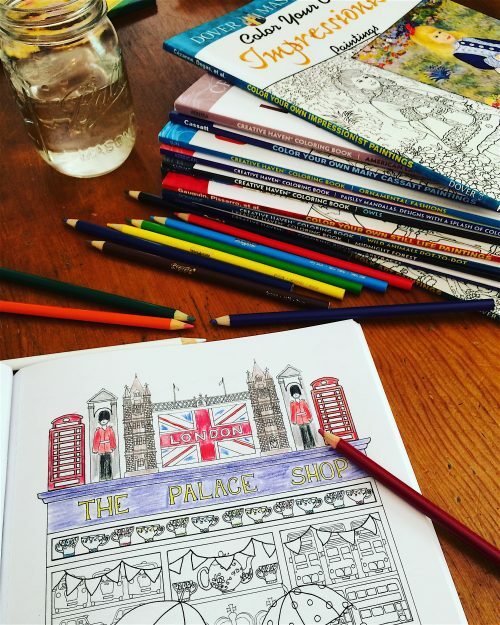 With these wonderful resources, you can see why adult coloring books are all the rage. We call them coloring books for all ages. We keep them stacked within sight so it is easy to pick one and sit and color. It’s a Dover Publications coloring sort of art afternoon! 🎨 This CityScapes book with a hidden pictures twist is such fun. 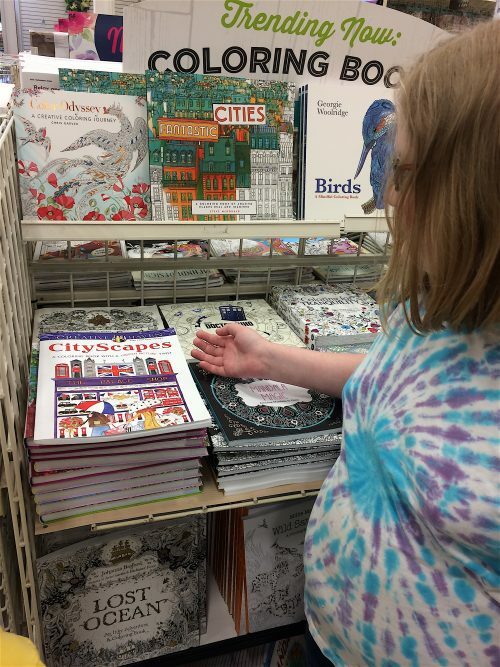 My ‘Where’s Waldo’ girl loves to find the crowns, hearts, cats… And there is plenty of geography learning in the mix. 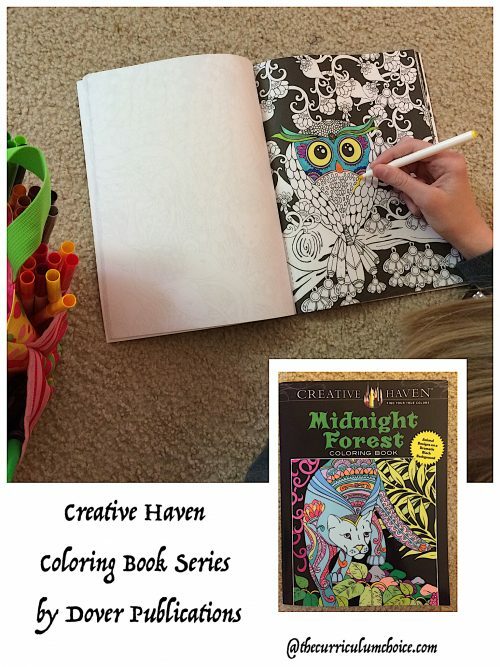 CityScapes from the Creative Haven coloring book series. 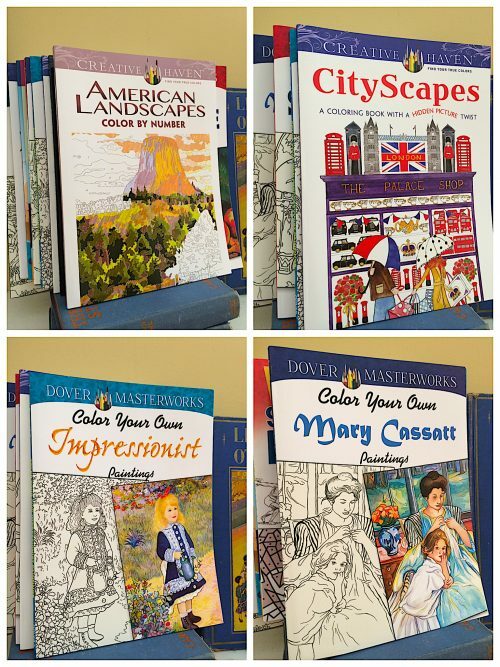 Dover Publications has two series of coloring books that we particularly love. These are Creative Haven and Dover MasterWorks. Coloring The Corner of the Table by Victoria Dubourg in Dover Publication’s Color Your Own Still Life. You, our fellow artists, will love the simple art appreciation of the MasterWorks series. Color a page in the style of your favorite master artist! Notice the detail, the shading the artist used and build your skills. Each book is centered around a topic or theme. This Midnight Forest book is full of beautiful animal illustrations! The American Landmarks book has gorgeous color by number pages that are so sturdy you can even mount and frame one. The perforated edges make them easy to pull out. American Landmarks even has a page for Providence Canyon in our own state of Georgia! We have been displaying these beautiful coloring books on our family room mantel so that we can choose a coloring page a day! One, high quality Dover Publications coloring book is just $5.99. Only the American Landmarks book is $9.99 (and I can see why – it is beautiful!) With a price like that, each of our family of seven can have their very own copy. Plus, with the discount code, below, you can save even more! Be sure to browse the Dover Publications store and pick out your favorites for summer! It is Dover Publications 75th anniversary! 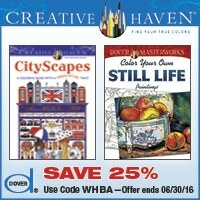 In celebration, they are giving away a Creative Haven and MasterWorks Summer Coloring Sampler Pack that includes the following books – total package worth $75.88!! I just simply can’t resist such beautiful resources that are so frugal! How about you? I have purchases many of their books over the years, but not recently. Maybe it is time. Thanks for showing how these can be used with teaching our children over the summer. I really like the landscapes! We love Dover coloring books. Even our boys can find titles they enjoy like Warriors though history and castles. We love coloring during read aloud time! These would be great and the American Landscapes book would go right along with our current studies. 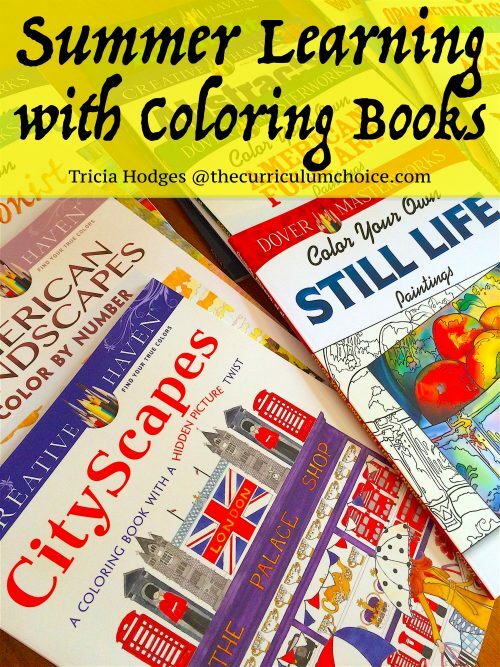 My littles would enjoy the color by number to get them started with coloring ideas. 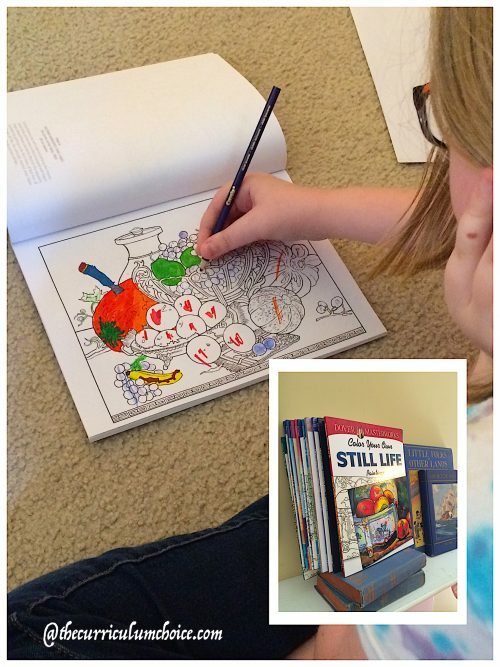 The Still Life Paintings is a beautiful coloring book! My son loves mosaics. I would love many of them. My girls love all the ones where you color famous artwork so would love to get more. We have not done the still life one yet. I have loved Dover material. As a homeschooler going on year 16 we have used many of the coloring books as part of our lessons. I like them all. I think my kiddos would love the Artists series–so different than any others we’ve tried! I think my son would love the Creative Haven CityScapes Hidden Picture Twist (although they all look great)! Love how we can incorporate these into our art class for homeschooling. Thank you so much! We would probably like most of these books. I love this idea. I’m planning an American History/ Geography unit for us! We homeschool year round. I LOVE how American Landscapes would fit in! We love coloring. Its perfect for rainy days, sick days, and restful family activities. We would love the Cityscapes book with the hidden objects. So much fun! Thanks for a chance to win! I think the color-by-number books would be a hit with my girls! My girls have enjoyed several Dover coloring books. This is the first I have seen of these, though. They would love anything with birds, butterflies, or horses. I love the idea of the poster books – I wonder how they would turn put if each family member colored a different page? It could be awesome! We would love to use these this summer! I would love to have the birds or Impressionist books, though they all look great! For me I loved the Victorian Homes book! Thank you for the opportunity to win! These look like fun! I may even color too! I really like the Color Your Own Monet and the Animal Mosaics. But they all look great!